Saturday August 31, 1889 We put out another lot of corn today and I sewed on my dresses all the time I had. Mother was in town in the morning and Fanny brought her home. Will and I went to town after supper and down to Holsons to call on Ida. Sunday September 1, 1889 I was busy about the work most of the forenoon for we put up some corn to dry. The folks were over all afternoon and I visited with them. I wrote a little in the evening. 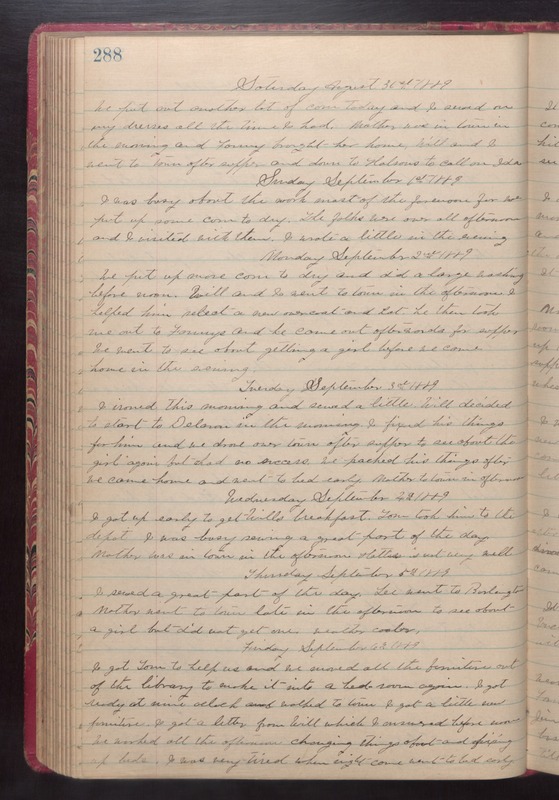 Monday September 2, 1889 We put up more corn to dry and did a large washing before noon. Will and I went to town in the afternoon. I helped him select a new overcoat and hat. he then took me out to Fannys and he came out afterwards for supper. We went to see about getting a girl before we came home in the evening. Tuesday September 3rd 1889 I ironed this morning and sewed a little Will decided to start to Delavan in the morning. I fixed his things for him and we drove over town after supper to see about the girl again but had no success. We packed his things after we came home and went to bed early. Mother to town in afternoon. Wednesday September 4th 1889 I got up earlty to get Wills breakdfast. Tom took hiom to the depot. I was busy sewing a great part of the day. Mother was in town in the afternoon. Hattie is not very well. Thursday September 5th 1889 I sewed a great part of the day. Lee went to Burlington Mother went to town late in the afternoon to see about a girl but did not get one. weather cooler. Friday September 6th 1889 I got Tom to help us and we moved all the furniture out of the library to make it into a bed room again. I got ready at nine oclock and walked to town. I got a little new furniture. I got a letter from Will which I answered before noon. We worked all the afternoon changuing things about and fixing up beds. I was very tired when night come went to bed early.